O Experimental category, 105 System (copy of Aerostar S60A) Envelope Mfd. 1985. 130 hrs TT. Two- point suspension, steel cables. Velcro Rip Top. Side maneuvering Vent. Nylon Skirt. Fabric pulled to 45lbs at last annual in May 2005. Some moderate to high porosity readings at last annual in Dec. 2001. Classic Limited basket. Wicker in very good condition. New handrail leather. Two-point aluminum uprights. No upright covers. Two 20 gal laydown tanks w/covers. Ball instrument pack. HP2D update (liquid pilot) Burners. Needs new fuel hoses. 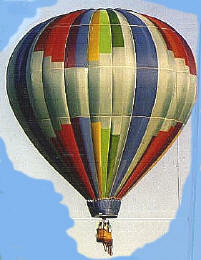 $3500.00 Contact: Paul S. Stumpf (802) 875-1600 -or- psstumpf@aol.com Please mention Balloon Model and Total Time when e-mailing to request more info.